At 10 a.m. the “Band” struck up the air “Strike Your Tents & March Away”. When we draw our pins in half an hour the base drum beat & at the “third tap” the tents of our Regiment fell to the right and were rolled up & carried to the R. R. with the other heavy baggage. Our knapsacks were hauled in the wagon. At 11 and ½ a.m. we formed line, stacked arms & were dismissed to fall in at the tap of the drum. At 1 p.m. the Brigade was formed and we started on our march for Bacon Creek. We went down the L. N. Turnpike which is the worst pike I ever saw and we made nearly all of 15 miles in double quick time arriving here at 6 p.m. very tired. We pitched tents as soon as we came, but it was very cold sleeping as our knapsacks were with the wagons which did not arrive untill 1 a.m.
Frederick the Great, Marlborough and Napoleon--saying nothing of Wellington, who, like a second Moses, lived from the Pisgah of 1850 to see some strange changes--would have stared at the manner in which a modern army takes the field. The command of Richard to "saddle white Surrey for the field to-morrow," and these iron monsters would have carried 1,000 of knights-at-arms with the ease the good horse Surrey carried one man. 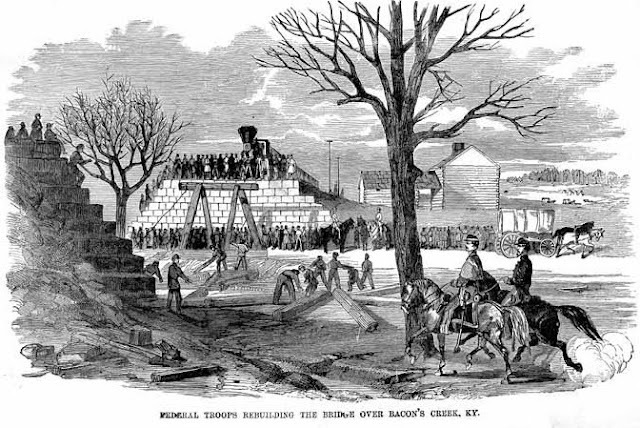 Our Artist has made this very palpable in the sketch we publish to-day, when the long train of carriages on the Louisville and Nashville turnpike carrying grim soldiers of Uncle Sam, sworn to prevail or perish in a deadly field, looks more a holiday excursion, presided over by the benevolent Barnum or the judicious Jarrett, than the heroes of a hundred coming fights. The Louisville & Nashville Railroad indeed provided an important lifeline for soldiers in the central divisions of Buell's Army of the Ohio. However, it only went as far south as Bacon Creek, where Confederates had burned a bridge on their retreat in November, and then again on December 5 by Confederate cavalry. 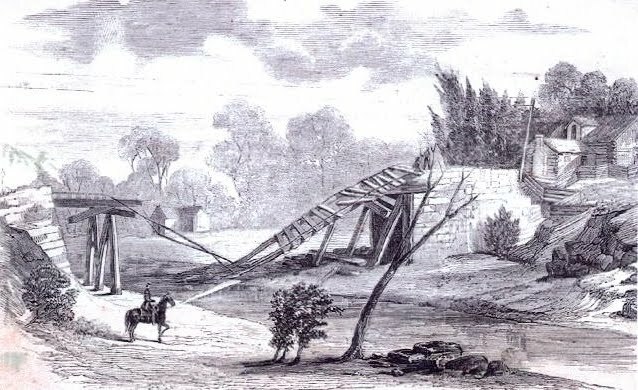 The task of rebuilding the bridge fell to the 79th Pennsylvania's Colonel Henry A. Hambright and his senior captain, William G. Kendrick. Recall that before the war, Hambright superintended the construction of canal and railroad infrastructure around Lancaster. Kendrick also had construction experience, winning the contract for bricklaying (maybe masonry, too?) for the Lancaster County Courthouse in the mid-1850s. A force consisting principally of details from the 1st Wisconsin, Col. Harkweather, and the 19th Pennsylvania, Col. Hamblight, of Gen. Negley's brigade, was set to work, and assisted by a force of workmen sent down by the railroad company, the bridge was entirely rebuilt and a training running over in 24 hours. An army composed of such material can't be whipped. The regiment spent the next several days at this new camp, which Adam Johnston of Company D recalled as "Camp Wood," just north of where the Louisville and Nashville Railroad crossed the Bacon Creek. Their next move would be on December 17, when they struck tents and marched ten miles to Munfordville, Kentucky. However, as soon as they began to pitch tents in this new camp, they heard the sounds of the first serious battle of the center wing of the Army of the Ohio taking place just a mile or two away. The 79th Pennsylvania "formed line in double quick time & started for the scene of the action." [JHD, 12/17/1861] Stay tuned for more details in a couple days.